The new 229,000 sq. ft. Nazareth Area Middle School’s massing and design makes strong reference to the historic buildings constructed by the original Moravian settlers in Nazareth, Pennsylvania, in the mid-17th century. The Board of School Directors requested the project be designed to achieve a LEED Gold rating under guidelines of the U.S. Green Building Council, Leadership in Energy and Environmental Design. The 1,000 student school is organized around a central administrative core, state of the art media center, and cafeteria. The two-story classroom wings for each 7th and 8th grade level extend east-west to maximize daylight benefits. Sharing a common lobby are the auditorium and the related art wing that includes drama, music, and technical education programs. 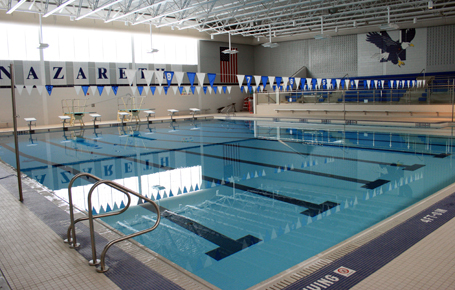 The physical education wing contains a 1,000 seat gymnasium, life fitness center, team room, and a natatorium for competitive swimming pool for the entire district’s use as well as public use.